One can only imagine the possibilities when the country’s top fashion bloggers come together under one roof, let alone with the country’s longest running annual charity bazaar and the #1 telecommunications company in the country. What is certain though is that the combo will make for the hottest holiday event of the season. 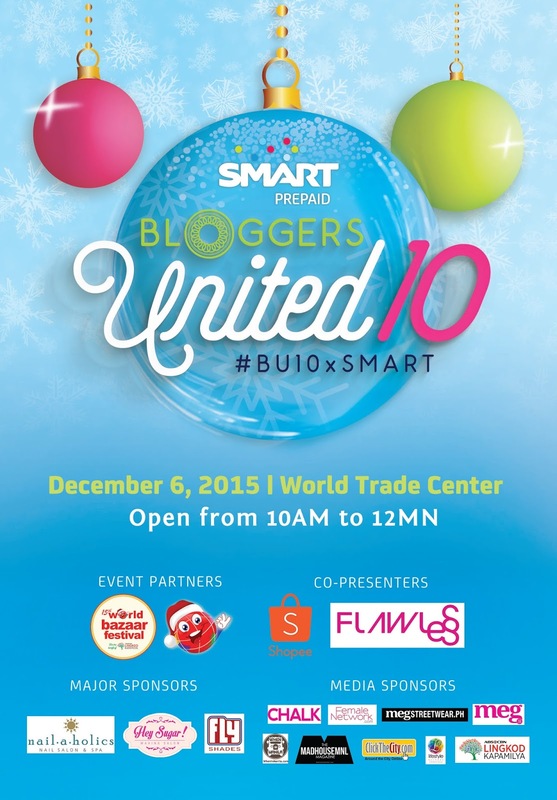 The 15th World Bazaar Festival (WBF) and SMART Prepaid are more than thrilled to welcome back Bloggers United as they team up to bring you “Bloggers United 10” happening on December 6, 2015 from 10AM to 12MN at the Mezzanine floor of the World Trade Center Metro Manila where you will find only the best and trendiest finds around as curated by the most stylish crop of trendsetters. Founded in 2011, Bloggers United is a series of bloggers’ bazaar held in the metro to serve as a platform where bloggers can network and interact among themselves to nurture the online Filipino community through a celebration of beauty, fashion, and style. As such, a collaboration with WBF entails a brighter opportunity for Bloggers United to reach out to the blogging community for a more meaningful and exciting experience this holiday season. Among the attendees of this year’s Bloggers United are top bloggers as well as style and fashion personalities such as Vern & Verniece Enciso, Jasmine Curtis-Smith, David Guison, Laureen Uy, Camille Co, Kryz Uy, Lissa Kahayon, Dani Barretto, Patricia Prieto, Mikyle Quizon and Divine Lee - promising a one-of-a-kind shopping experience presented by SMART Prepaid. In keeping with the spirit of the yuletide season, the event is likewise a part of a wider effort to promote charity as part of the proceeds of WBF 2015 will be for the benefit of the ABS CBN Lingkod Kapamilya Foundation. Don’t miss out on the most stylish event of the holiday season! The 15th World Bazaar Festival will run from December 4 until December 21, 2015 from 10am to 12mn (Fri-Sun) and 12nn to 10pm (Mon-Thurs) at the World Trade Center Metro Manila. Tickets are priced at P80.